Although present concern with global warming centres on rising concentrations of atmospheric CO2, concentrations of that gas have varied considerably in the past. Analysis of air bubbles trapped in polar ice indicates that the lowest levels of atmospheric CO2 occurred during the Quaternary glaciations (Delmas et al. 1980). 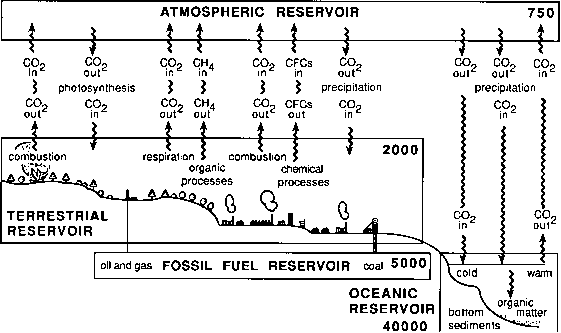 At that time, the atmosphere contained only 180 to 200 parts per million by volume (ppmv) of CO2, although there is some evidence that levels fluctuated by as much as 60 ppmv in periods as short as 100 years (Crane and Liss 1985). Levels rose to 275 ppmv during the warm interglacial phases, and that level is also considered representative of the pre-industrial era of the early nineteenth century (Bolin 1986). CO2 measurements taken by French scientists in the 1880s, just as the effects of the Industrial Revolution were beginning to be felt, have been reassessed by Siegenthaler (1984), who has concluded that levels in the northern hemisphere averaged 285 to 290 ppmv at that time. When the first measurements were made at Mauna Loa in 1957, concentrations had risen to 310 ppmv, and they continued to rise by just over 1 ppmv per year to reach 335 in 1980. Since then, levels have risen at a rate of 2 to 4 ppmv per year to reach a level of 345 ppmv by the mid-1980s (Gribbin 1981; Bolin 1986). That represents an increase of 70 ppmv in less than 200 years. The difference between glacial and inter-glacial periods was about the same, but then the time interval was measured in tens of thousands of years. The current level of 353 ppmv is 25 per cent higher than the preindustrial volume, and without precedent in the past 100,000 years of earth history (Watson et al. 1990). 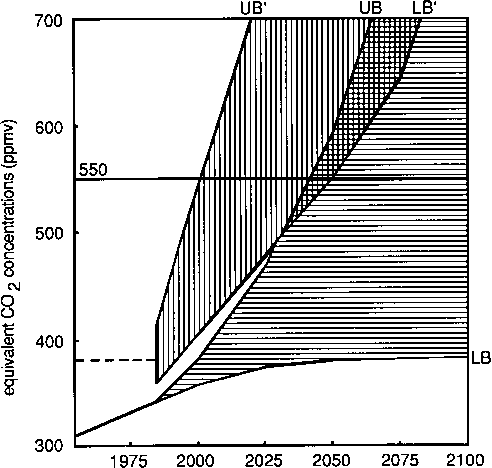 If the present rate of increase continues until the year 2050, it is estimated that the atmospheric CO2 concentration will be 450 ppmv, and by 2075 it will be 500-600 ppmv, more than twice the 1800 level (Bolin 1986) (see Figure 7.6). What is the normal levels of carbon dioxide in the atmosphere?